Figuring out how to choose a pet friendly carpet or rug can be a priority for pet friendly families. The best kind of pet-friendly rugs and carpets are extremely durable and stain-resistant. Since area rugs and carpeting can be made from so many different types, and strengths of fibers, it’s important to choose one that can withstand your pet’s tiny little claws. When it comes to the pile of your rug, cut piles are better for pets than loop piles. Loop piles can be easily ripped up by a dog or cat—not to mention their claws can get stuck in the loops and cause injury. Another tip: keep your cut pile low. High-pile rugs and carpets can trap pet hair and dander, exacerbating allergies and lowering your home’s air quality. If you still choose a high-pile rug make sure to have it cleaned or clean it yourself at least once per year. Thanks to advances in rug making technology, there is a wide variety of stain-resistant rug and carpet material designed to hold up to even the toughest wear. There are two schools of thought on the best rug material for pets: synthetics like nylon and olefin, or natural materials like wool. Both have their positives and negatives. Nylon rugs and nylon-blend rugs are some of the most durable and stain-resistant rugs for pets. Polypropylene or olefin rugs are also extremely stain resistant and highly durable, except when it comes to oil-based stains. Another pet-friendly rug option to consider is cowhide. While not a traditional rug material, the texture of cowhide naturally repels pet hair and its durability makes it a great pet-friendly rug material. Mohawk is known for their stain resistant SmartStrand technology. With their addition of SmartStrand Forever Clean, the most durable, easiest to clean carpet on the planet just got better. SmartStrand Forever Clean carpet now features All Pet Protection and Warranty, the only pet-friendly carpet protection system that covers all pets, all accidents, all the time. Now SmartStrand is an even smarter choice for pets and pet owners. Each strand of SmartStrand Silk carpet is packed with 700 silk-like, stain-resistant fibers. Thats 3X more individual fibers than found in ordinary nylon carpet. 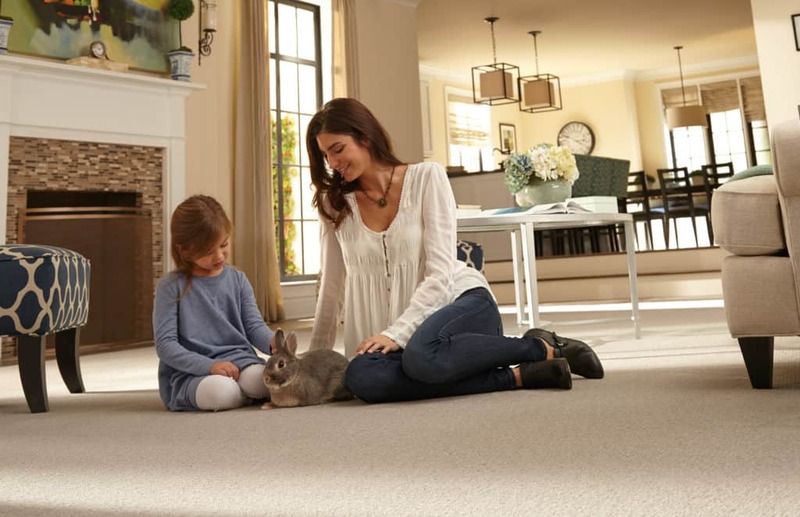 The results is a dense, durable carpet that’s luxuriously soft to the touch without sacrificng performance. Natural rug materials like sisal and jute make for good pet-friendly rugs because theyare easy to clean and the sisal rugs will help catch dirt and sand from your pet’s paws. However, sisal rugs and jute rugs tend to show liquid stains so use your best judgment when choosing sisal rugs or jute rugs for your pet. Wool rugs are also always an option, however, they tend to be much more expensive and, while easy to clean, they’re also easy to rip up and ruin. Stay away from finer materials like silk and wool for your pet-friendly rug. Another major consideration when choosing a pet-friendly rug is the color or pattern. Not only will your rug’s color change slightly under different lights, some colors hide dirt and pet hair much better than others. Your first instinct may be to choose a dark colored rug to hide dirt and dander, but not if your pet has white or light-colored hair! 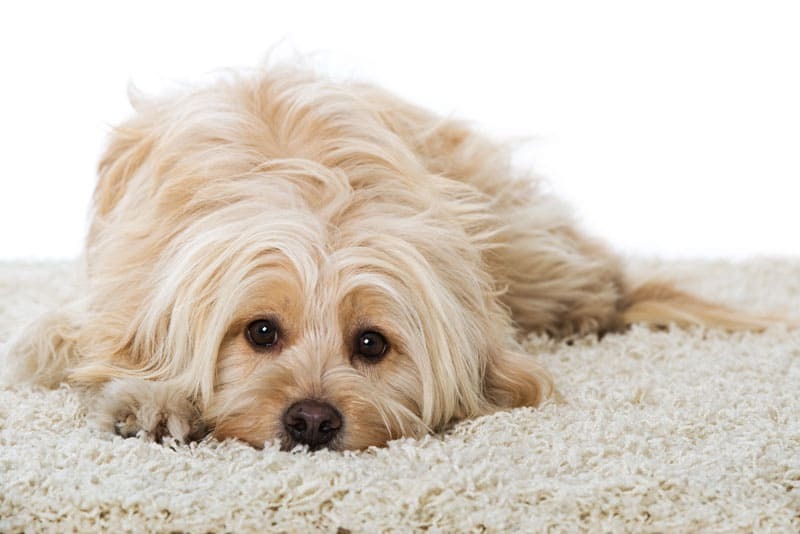 Light-colored rugs will show stains more but can hide pet hair better. A good rule of thumb is to try and match your new rug color to your pet’s hair color if possible. When it comes to pet-friendly rug designs, patterns and color combinations are definitely your friend. Rugs with different colors are great at hiding small stains while repeating patterns and medium-to large-sized medallions will disguise footprints and pet hair. No matter what material, style, or color rug you decide on buying you’ll need to take proper care of it, especially since you have pets in the house. Vacuum your rugs regularly and try to have them professionally cleaned once per year to get rid of all the dander and allergens a regular vacuum can’t get. Keeping these considerations in mind we’re sure you’ll be able to find the right rug for yourself and your four-legged friends.